I have been on Kalymnos for a couple of days past a month now. I seem to be well adapted to the climbing, aegean climate and island rhythm. My wife and I are staying under the vast array of climbing sectors above the area of Armeos, just a short walk from the main tourist hamlet of Massouri. The sectors above our small studio are the classic hot-weather climbing areas. The line of crags is dominated by the always impressive Grande Grotta teeming with tufa pipes, stalactites and gargoyles. This is my fourteenth or fifteenth trip to Kalymnos over the past twelve years. My focus this season, outside of personal training sport climbing, is to further establish my climbing business activities on the island and build on the foundation that I have established here over the past years. My wife and I want to cultivate a lifestyle in which we are residents of Kalymnos for up to five or six months every year. My Kalymnos specific website is kalymnosprimalclimb.com. 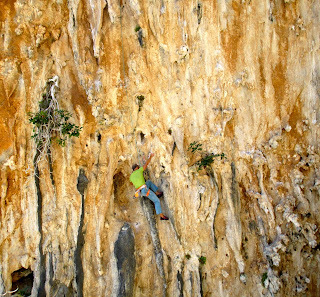 I also have other social media linked to my sport climbing activities on Kalymnos to be found on Facebook and Twitter. The summer season on Kalymnos is noticeably slower than in previous years. The main reason seems to be that there are no longer convenient flights to Kos airport for a lot of those travelling from the UK and parts of western and central Europe. The landing fees and conditions are rumoured to have caused many of the more affordable carriers to bypass Kos in favour of using other islands in the Dodecanese. Next year, the Kos airport will be under new management. The flight situation should be much better in 2018. The local businesses are making their dissatisfaction known, and in talking to some of the bigger generators of climber and beach tourist turnover on the island it is clear that the current situation with the airport on Kos will not be tolerated for another season. May was fairly busy with great climbing conditions that carried over into the first two weeks of June. You can see the white froth on the waves as the strong winds blow in from the north in front of Tolendos island in the first photo above. I had a couple of clients at the start of June and then some last-minute shorter-term instructing that all was a blast and quite fun. I will see what transpires in the next few weeks into the start of August, which is generally a pretty slow time for climbing on the island. All that is fine as I need to get in my training time too. 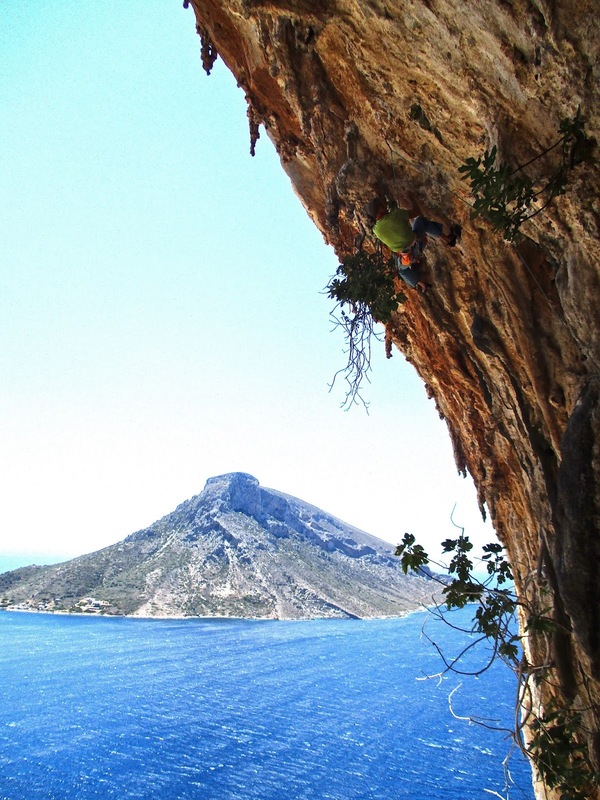 I am doing two 'new' personal things with training this year on Kalymnos. The first is to practice, perfect and streamline rope soloing multi-pitch routes. The second is to do ultra endurance training with a lot of trail running and long-distance hike/run combinations. Optimising rope soloing technique is all about learning and experimenting with systems that allow you to move steadily and smoothly with of course 100% safety. It is also great climbing endurance training as one must move over each pitch three times: 1) climb on lead, 2) rappel pitch, 3) climb pitch on top rope. This means that you climb the route two times up and rappel the route once. 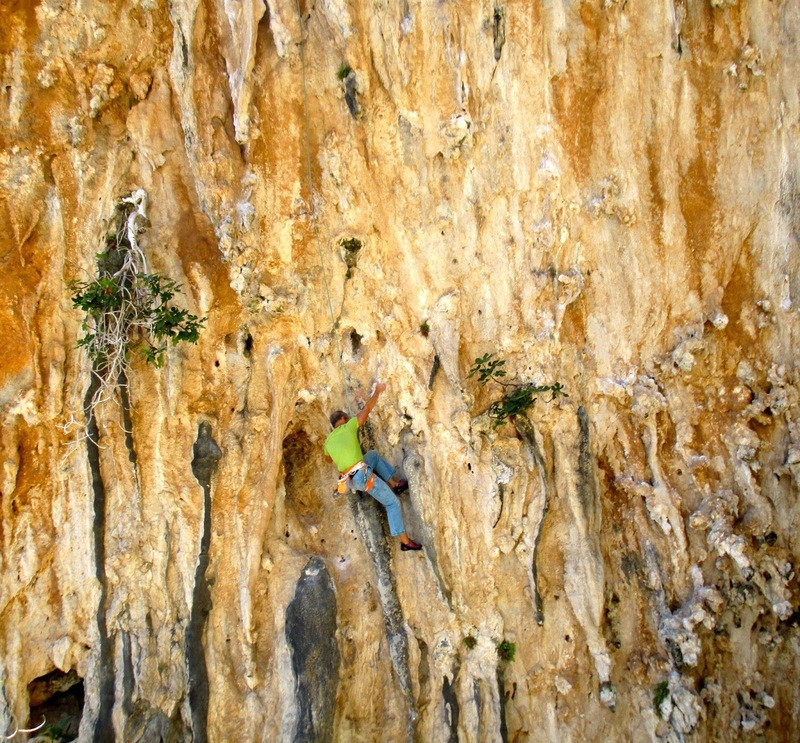 I have done two easy/mid-grade routes on Kalymnos and Tolendos. For the more traditional ultra endurance training, I am relying on a wonderful resource from Carl Dawson (a part-time Kalymnos resident and accomplished climber too). Carl wrote a guide book, The Kalymnos Trail that uses ancient paths, goat trails and modern climber's approaches to link the villages and areas of the island together in ten stages. In combination with the Kalymnos / Tolendos 1:25.000 trail map from Terrain, I can make up extensive trail routes of various lengths over the upper valleys, ridges and peaks. For quicker runs, there is always the route along the road from Massouri to Emborios or the loop around Myrties. I will be posting more about both rope soloing and trail running on Kalymnos. During the time of year when my wife and I are living on the island, we are continually thankful for the simple life here and the balance of working, being outside, sport climbing and training.